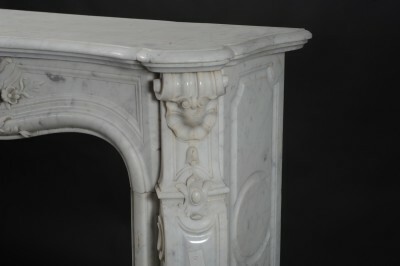 The sculptured decoration of this piece, also known as 'pig's tail' decoration, is of an exceptional quality. 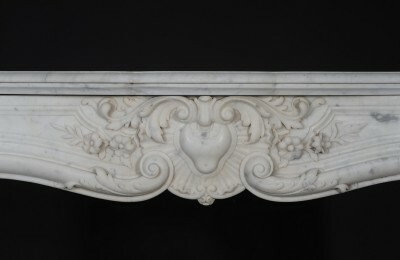 The panelled entablature is centered around a heart-shaped cartouche issuing sun rays, delicate flowers and foliated scrolls, all richly carved with elegant details. The shaped jambs are decorated with carved shells, scrolled acanthus leaves and bell flowers. 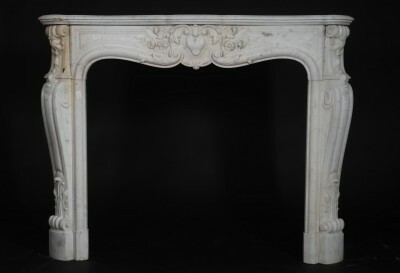 The Carrara marble is precisely cut giving an impression of suppleness to the various elements.